U.S. Secretary of State Hillary Rodham Clinton announced Wednesday that Washington will impose new sanctions on North Korea in a bid to stem the regime's illicit atomic ambitions. Clinton, speaking at a joint news conference in Seoul after holding unprecedented security talks with U.S. and South Korean defense and military officials, said the sanctions were part of measures designed to rein in the regime's nuclear activities by stamping out illegal moneymaking ventures used to fund the program. "These measures are not directed at the people of North Korea, who have suffered too long due to the misguided priorities of their government," Clinton said. "They are directed at the destabilizing, illicit, and provocative policies pursued by that government." 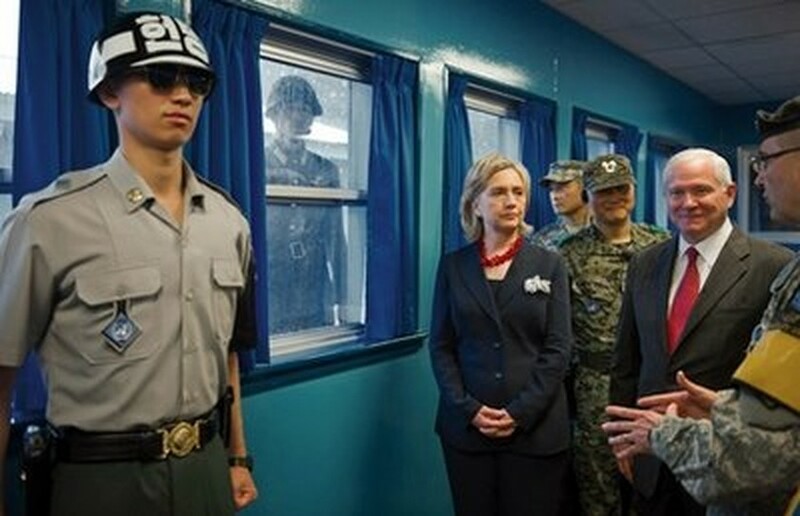 U.S. Army Col. Kurt Taylor, right, briefs U.S. Secretary of State Hillary Rodham Clinton, center, and U.S. Secretary of Defense Robert Gates, 2nd right, at the truce village of Panmunjom in the demilitarized zone (DMZ) that separates the two Koreas since the Korean War, north of Seoul, South Korea Wednesday, July 21, 2010, in Seoul, South Korea. The U.N. Security Council has imposed stiff sanctions on North Korea in recent years to punish the regime for defying the world body by testing nuclear weapons and long-range missiles, and illegally selling arms and weapons. With few allies and diminishing sources of aid, impoverished North Korea is believed to be turning to illicit ventures to raise much-needed cash. Pyongyang also walked away last year from a disarmament-for-aid pact with five other nations that had provided the country with fuel oil and other concessions. Clinton, making a high-profile trip to South Korea with Defense Secretary Robert Gates just four months after the deadly sinking of a South Korean warship, urged North Korea to turn away from its path toward continued isolation. "From the beginning of the Obama Administration, we have made clear that there is a path open to the DPRK to achieve the security and international respect it seeks," she said, referring to North Korea by its official name, the Democratic People's Republic of Korea. "North Korea can cease its provocative behavior, halt its threats and belligerence towards its neighbors, take irreversible steps to fulfill its denuclearization commitments and comply with international law," Clinton said.